Prepping to Move | RV There Yet? We FINALLY got the truck registered late yesterday afternoon. Michael has been working so much lately that he hasn’t been able to get out of the office to do it and I tried doing it online and they wanted a $5.00 processing fee plus another 2.2% processing fee on top of that…plus I just couldn’t get their website to cooperate! Needless to say, the tags expired at the end of February so we had a nice late fee of $15.00. We scanned for a 1 ¾ hours and I’d say we got well over 500 pictures scanned! We each sat down at a scanner and scanned…sure did make it a lot easier and faster to boot! A few of our ‘old’ picture for your viewing pleasure are below. 1991 Jan 16 - Michael Leaving for Desert Storm. Our boys were 2 & 4. We had dinner at Tokyo Japanese Steakhouse…my favorite. We met 1LT Reeves and his girlfriend, Bailey there and had an awesome meal and even better conversation. Much of the conversation revolved around the military but we talked about all kinds of things. We ended up closing down the dining room we were in and finally made ourselves leave at 9:00 pm when the workers starting sitting down to eat! We’re looking forward to our next get-together with them. This morning we woke up to a very foggy world. It lasted until about 10:00 am and then the sun came out and it warmed up to about 80. Unfortunately, with the sun came the humidity. I had the windows and door open until about 3:00 pm and then I wimped out and turned on the a/c. I’m not a fan of a/c but being comfortable won out! I spent the morning prepping the coach for our journey tomorrow. I washed the few clothing items that were in the hamper, stowed any items that were on the counters or lying about, closed all the shades & windows, locked the shower & closet doors & pantry shelf in place and any other little things we do before hitting the road I also made some egg salad and tuna salad so that we could have lunch on the road tomorrow. When Michael came home from work he worked a bit outside to get things ready to go. We’ll need to start moving about 7:15 am or so to get all of the connections unhooked and to hook up the coach to the truck so that Michael can be to work by 8:00 am. He’ll work until about 11:30 am and then we’ll hit the road for our 180 mile journey to Twin Oaks RV Park near Elko, Georgia. Michael was at Ft Rucker (about 90 miles southeast of Montgomery) all day along with several other people from the unit doing Recon work for the upcoming Best Warrior Competition that they are hosting next month. Michael will need to be at Ft Rucker from April 22 – 26 for the competition and we are planning to attend the Alabama/Mississippi Heartland Rally in Gulf Shores, Alabama from April 26 – 29. 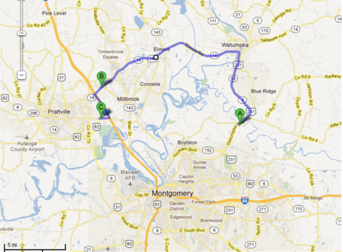 We decided that we’d pull the coach to Ft Rucker and stay at the Famcamp there and then head to Gulf Shores from there. We’ve never been to Gulf Shores so we’re both looking forward to it…it’s suppose to be very nice.